This beautiful necklace made from antiqued gold brass filigree and deep emerald green Swarovsky crystals and beads makes quite a statement on your neck. 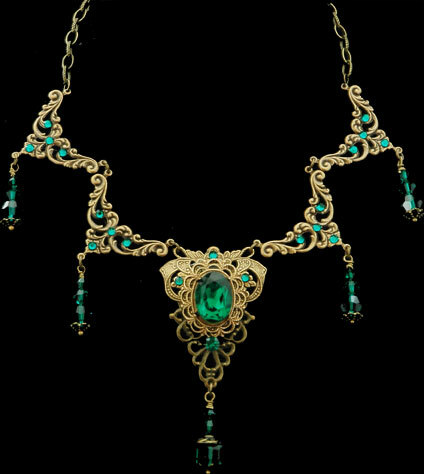 The intensity of the emeralds against the richness of the ornate antiqued gold is truly stunning worn with jeans and a tee or wearing a gown on your way to the Dickens Faire or the Edwardian Ball. Chain adjusts up to 18" in length. The centerpiece is 3" at it's longest point.